My little Marvel Smartasses, thrill to the villainy of a mid-level management miscreant we working joes can recognize from our 9 to 5’s … Meet K.O.D.O.M. … Kid-Brother Organism Designed Only to Micro-Manage. Unlike George Tarleton, who was an A.I.M. 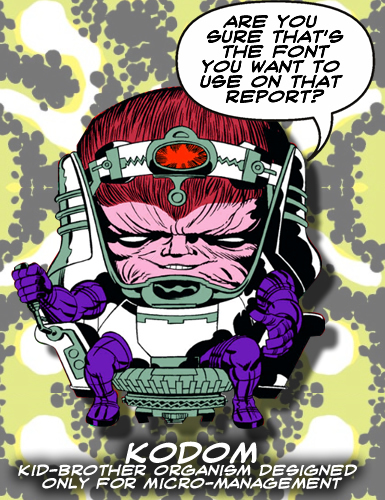 scientist who was tapped to become M.O.D.O.K. , K.O.D.O.M. has absolutely no qualifications to manage. He is, in fact, the red-headed mutated form of Jason Lively, who starred as Rusty in European Vacation and, more importantly, Fred Dekker’s classic Night of the Creeps! He’s not a scientist. He’s not good at his job. He’s not helpful. He’s annoying. He’s creepy. He’s deceptively nice. He’s going to throw you under the bus over the matter of a FAX cover sheet you used that he doesn’t like. This red-headed freak is, in fact, Marvel’s answer to Cousin Oliver from the Brady Bunch. He kinda looks like Oliver, too. This entry was posted in A.I.M. High, Comic Book Humor, Comic Books, Marvel Comics and tagged AIM, Blake Lively, Comic Books, Comics, Marvel Comics, MODOK. Bookmark the permalink.